I believe we have a resolution to the ABS issue! Usual chap had the MINI down in his workshop the weekend before last. 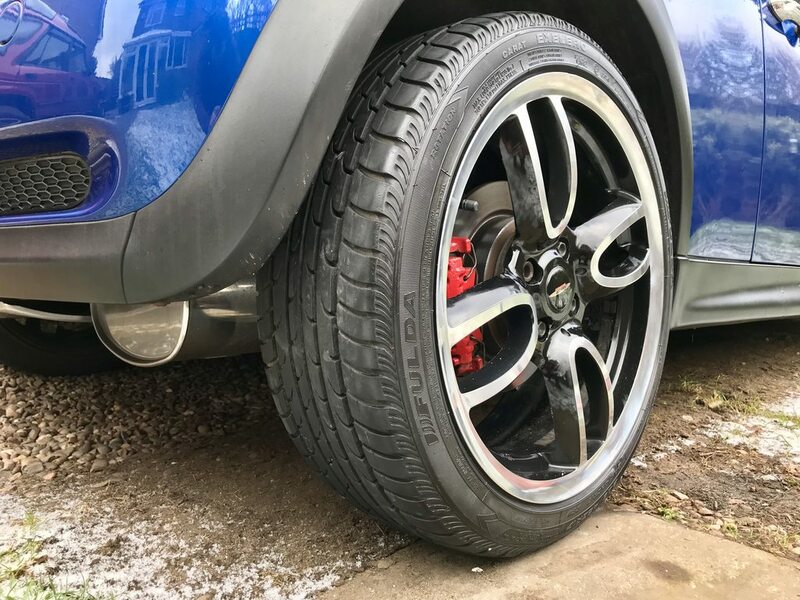 I provided him with a wiring diagram for the ABS system, a pack of scrivets for the front inner arches and a new Delphi ABS sensor which I had bought but not fitted - as the issue didn't seem sensor related at the time. He always says he feels bad that my cars are so clean, as he gets mucky hand marks on stuff. So I put a bit of protection on some surfaces for him! He removed the inner arches and checked all the wiring for the front ABS sensors but found no problems. However, after much testing - he decided to put the new Delphi sensor on the offside front. That immediately stopped the crazy readings for that wheel. He called me to say that he couldn't find any problems, but inexplicably - that new sensor seemed to have solved the problem on the offside front. 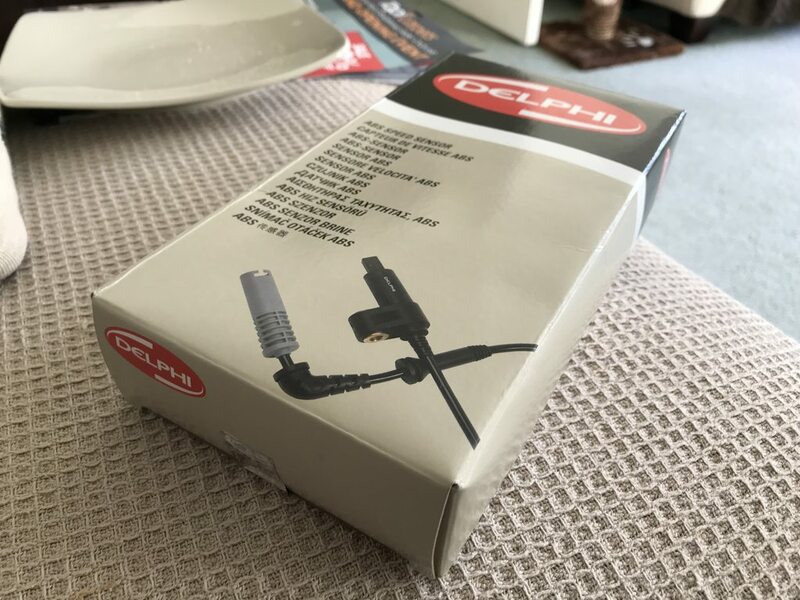 So the only thing we thought was left to try, was to order a Delphi branded sensor for the nearside too. 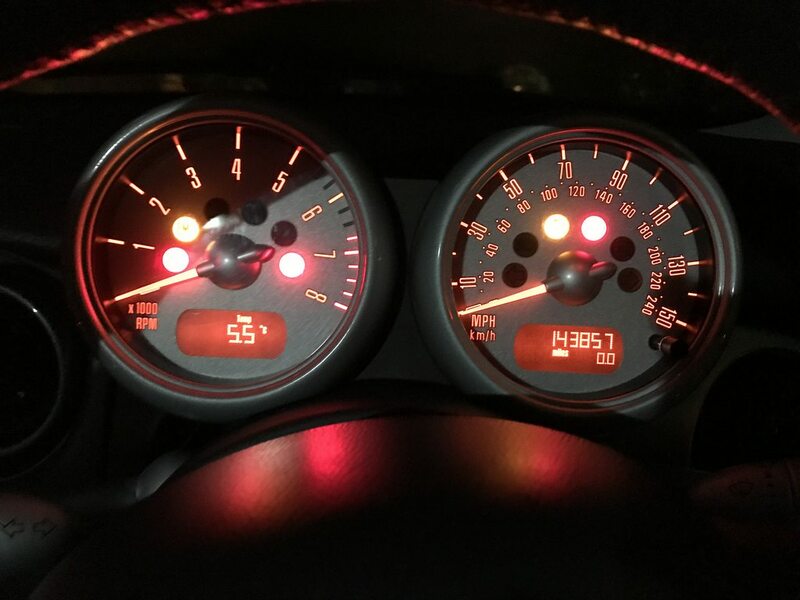 When I picked the car up from him and drove it home, the ABS related lights all illuminated just as before (as expected, because the nearside sensor was still giving silly readings). However when I drove the car again later that day - no lights came on and it worked as normal! Keen readers will remember that this is the exact situation I was experiencing before I replaced the sensors for a second time. Spurred on by this slight development, I ordered a Delphi branded sensor to fit to the nearside just out of sheer curiosity! I gave the car a wash the next day, as it was looking particularly sorry for itself! Thoroughly nice chap, drove from near Humberside Airport which is the best part of 100 miles! I didn't move the MINI for a couple of days. When I next got into it - I noticed the whole gauge cluster was dead. No warning lights, trip computer screens, speedo or rev counter! The centre dial was working fine though. 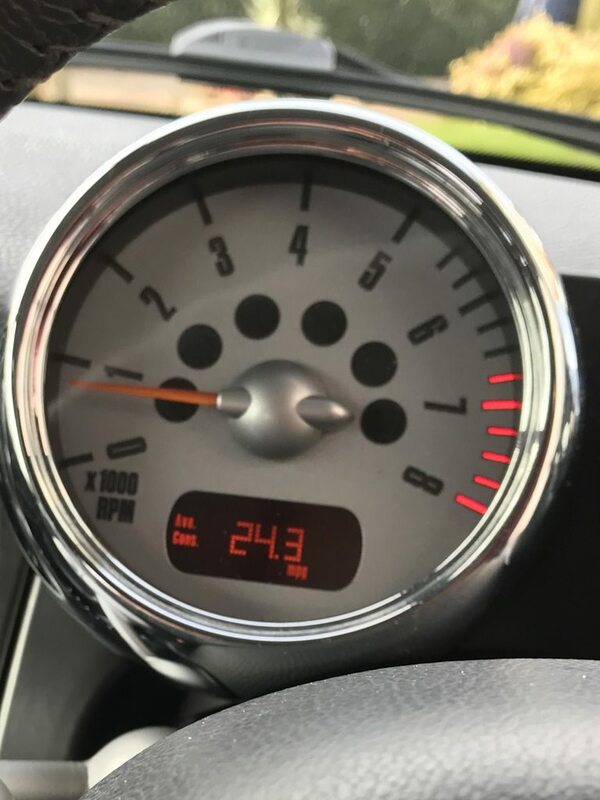 On most MINI's, this would be the speedo, but as my car has the chrono pack - the centre dial has oil temperature and pressure gauges etc, whereas the speedo is placed infront of the driver. My immediate thought was that it was probably linked to water getting in somewhere, as I had washed it and let it sit. A quick google revealed an issue with water getting into the BC1 unit, which is a body control unit (a box with a big circuit board in it which controls basically everything!). In a bit of a panic, I stripped off the trim in the driver's footwell and found the unit. It has 4 large connectors with many wires going to each. The area below the BC1 was soaking! I tried wiggling all the wires and connectors in the area, but nothing I messed with would generate even a flicker from the gauge cluster. I then disconnected the battery and removed the BC1 unit and opened it up - it was totally dry inside, which was at least some relief. I then put the BC1 back in the car, but left the trim off so that I could dry the area out and reconnected the battery. By chance, I rested my hand on the gauge cluster as I stood up - and the whole thing flashed into life briefly! A few more test punches and it would flash. Turns out I had been hasty in assuming the problem was water related, rather than checking the dials themselves. Although this luckily led to me finding the leak in the driver's footwell which is something I could address before it damaged anything. So I set about removing the gauge cluster - the connector was fully locked into place, and wiggling the wires didn't seem to do anything, however bashing or twisting the cluster would make it flicker a little. The connector on the back seemed perfectly clean too, so I decided to remove the cluster and take it indoors - I then dismantled it. There wasn't anything obviously wrong or damaged inside it, except from some sticky residue covering all the pins which went from the connector on the rear to the main circuit board. I sprayed the area with contact cleaner, dried it by the fire for a bit and reinstalled. The gauges were working fine, so I locked the car and left it over night. When I returned the next morning, the gauges were totally dead again (maybe the heat from drying them by the fire somehow helped a dodgy connection internally?). By this point, my patience had worn very thin - as the ABS issue was still outstanding and now I had no dials or anything!!! Luckily, the gauge cluster is only a 'satellite' part, and doesn't actually store such things as the vehicle mileage, so I was able to buy a new cluster from eBay and just plug it in for £50. I'm glad to report that the new cluster has fixed the problem completely - I presume the old one had an internal issue. It doesn't seem to be totally unheardof with these cars. The new one actually has a chrome surround which I rather like! Although I will paint the silver surround from my old cluster in anthracite to match the rest of the interior at some point. With that issue out of the way, I was able to focus back on the ABS problem! The Delphi sensor had now arrived, luckily I'm quite experienced in changing these sensors now!! So the change only took about 15 minutes max. This was last Thursday - and the lights haven't been back on since! I think we finally have a resolution to the problem! I first started driving the car in August with an intermitted ABS fault which occured when going over bumps in the road. I replaced the front sensors with cheap eBay items which was initially fine, but gradually manifested into an intermittent fault on cold mornings which would clear when warmed up. 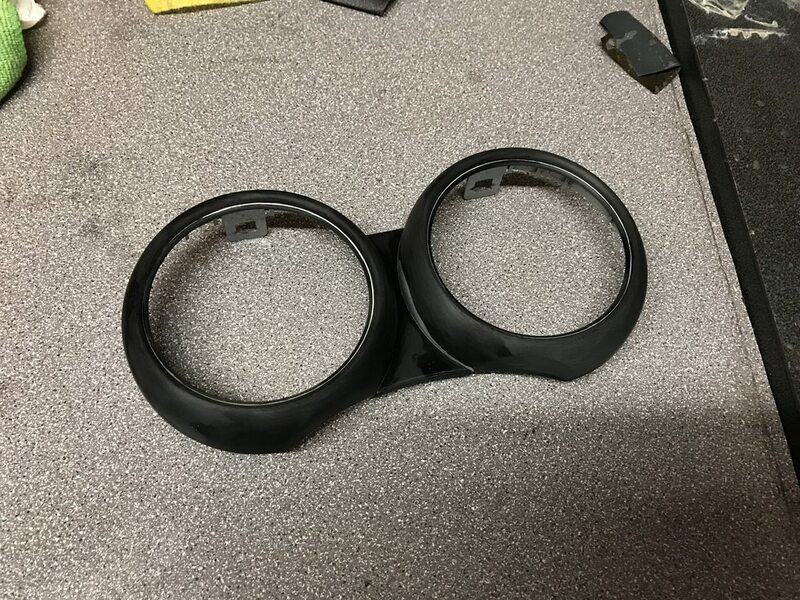 I replaced the front sensors again with (what I was told were) quality items from BuyCarParts, which caused a constant fault which would not clear. After 'ruling out' the front sensors, I investigated every other possiblity for the cause at some considerable expense. I then replaced the front sensors for a THIRD time, with actual quality boxed and branded parts, and the issue was fixed. So I would say the moral of the story is to use quality parts - but in my defence, I thought I had done that when I bought the second set! 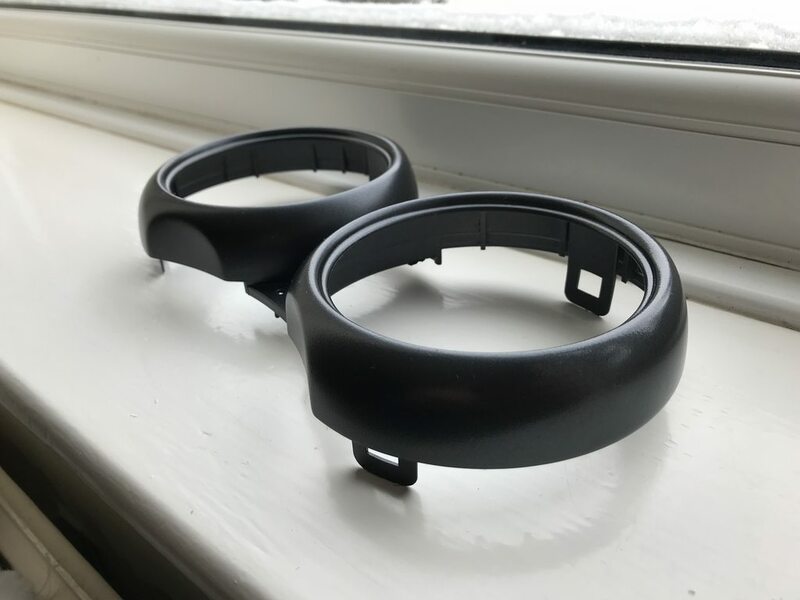 I therefore have to apportion a lot of the blame towards the people who supplied me the sensors which claimed to be made by TRW (an OEM supplier of a lot of ABS parts) although I have my doubts, as BOTH were faulty! 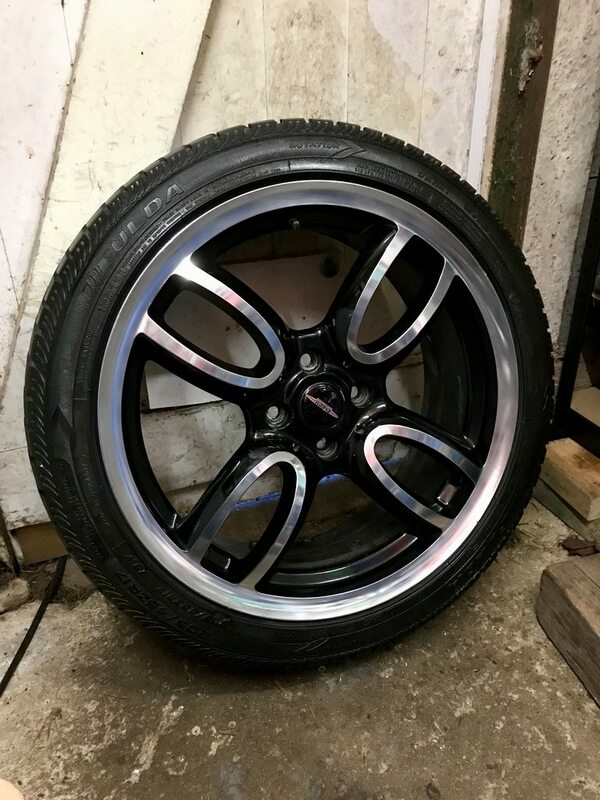 https://www.buycarparts.co.uk/ - Please never use them. Their customer service and delivery times are dreadful. My last task was to fix the wet driver's footwell. 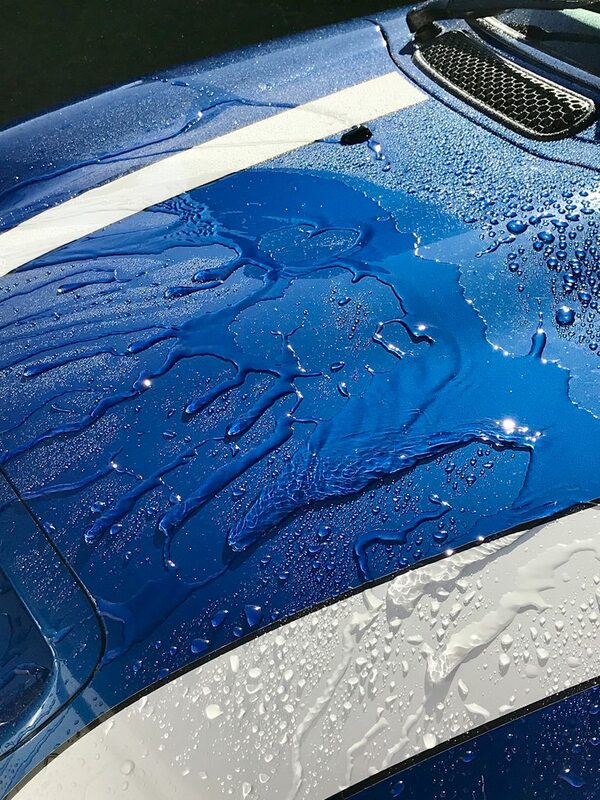 I did what I could to dry it out - with the trim left off, I parked the car in the sun and also drove it with the heat on full, blowing into the footwells. That dried it out pretty much entirely over the space of a few days, so I reassembled the trim once again. Having put so much time into trying to fix the car, I wasn't going to spend ages trying to trace the leak at this stage, as it was getting on my nerves - so I checked the MINI forums and found it is common for there to be a leak behind the driver's side outer A-pillar trim (the glossy black piece between the windscreen and driver's window. 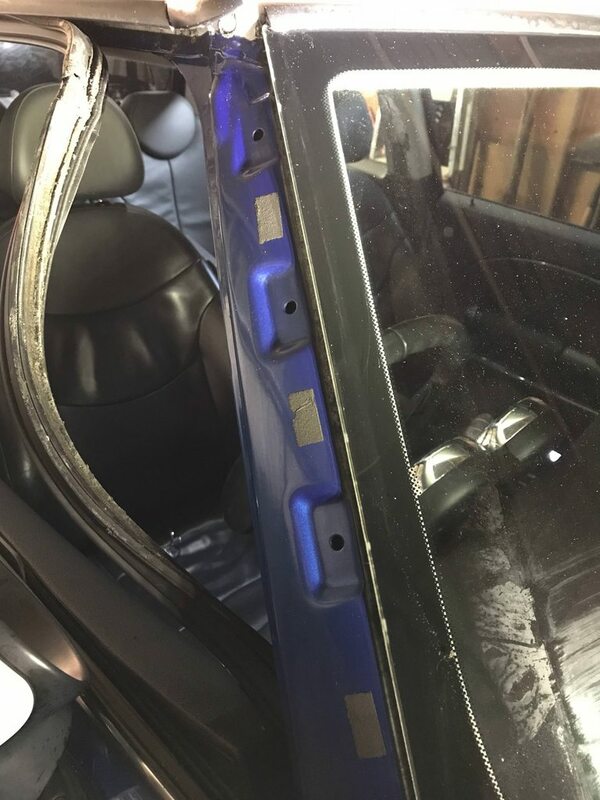 I removed the trim by peeling back the door sill rubber (which was gross, so I cleaned it - another possible leak source) and then removing 4 screws to get the trim piece off. It has a foam backing seal behind it. The whole thing was very wet and mucky. I cleaned everything up and dried it off, then applied a tonne of black flexible roof & gutter sealant. I use this product on my Land Rover where the external window seals crack and let water in. It is black and dries fairly hard, but doesn't stick things together too much. So my thinking was that if I remove the trim piece on the MINI again, it won't be welded in place! I applied it to the trim piece, the foam backing and the a-pillar on the car itself. So hopefully this will stop my leak. Time will tell on that one! I don't particularly trust the door seals on these cars, as the doors are pillarless, so the window pressing against the door seal and it electrically hotching itself up when you close the door is all that keeps the water out. Whilst I had the car in the garage, I decided to address the leak inside the tailgate . On a couple of occasions, the tailgate release would go crazy and repeatedly try to operate. In addition to this, after washing the car and opening the tailgate - water would sometimes rush out of the trim panel! The centre brake light is a common place for water to get in - so I removed it, cleaned it up and ran a bead of silicone around the edge. I had also noted that the seal between the boot lid and reg plate light trim wasn't in great condition, so tidied that up with a bit of the black sealant used above. Also, my grandparents recently traded in their MINI One Hatch for a Cooper Countryman due to it being a lot easier to get in and out of. I advised them against the dealer's £500 Autoglym paint protection (worth mentioning that they were very vague about what sort of process it involved!) I really couldn't see any value in it, especially on a 4 year old car. 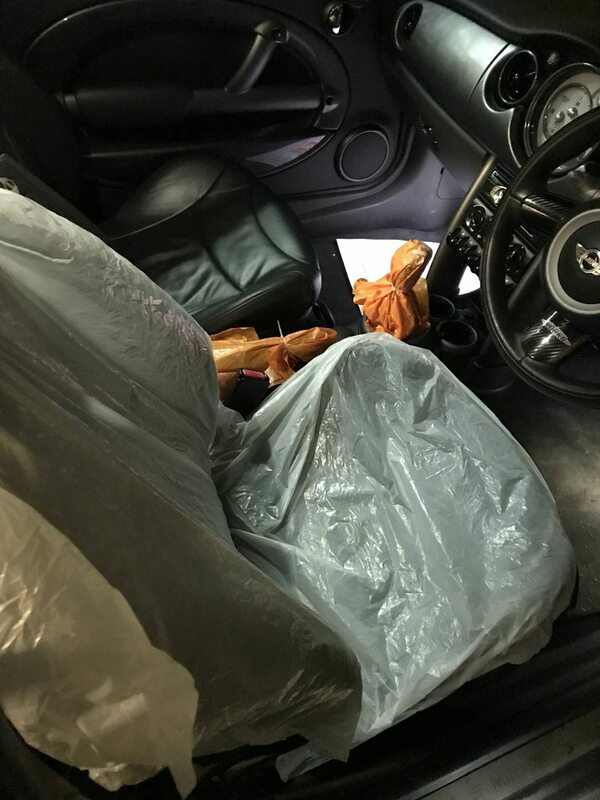 The dealer also claimed that the protection would last "for ever", even if you used automated car washes - which seems unlikely, even if it were a ceramic coating or similar. Instead, I offered to sort it out myself with the DA, then follow it up with a couple of coats of FK1000P to at least give it a bit of protection for a starter. It's actually a metallic red (Blazing Red) as opposed to the usual Chilli red. I'm not a big fan of the Countryman's looks - but I can't deny how much bigger it is inside! So plenty of progress lately and hopefully the ABS issue is behind me. My next task will be to get the front end off the car again and sort out the auxiliary belt which squeals under hard acceleration above 4500 rpm. If you gently rev it beyond that, there is no squealing though. Having a supercharger reduction pulley fitted puts extra strain on the system, so I intend to replace the belt tensioner and idler (both are already in stock), then get the alternator refurbished - it is charging ok, but I would rather get it back to 'as new', rather than have to go in there again in the future if I can avoid it. It's not a massively difficult job, but quite time consuming as the front bumper, crash bar and radiator have to come off. So I'll enjoy the car for a little while before opening that can of worms! For now, I just don't rev it high. Last edited by Andyblue; 10-02-2018 at 05:22 PM. Fingers crossed with the ABS situation ! Great write up and update on a great thread buddy ! I think this is one of the best threads in DW at the minute, you’re certainly keeping the car honest and roadworthy! I have secret love for the R53 Cooper S, I’ll buy one as a toy one day I think because they’re great fun and supercharger whine is addictive! Excellent mate, great write up! Not a big fan of Mini's, but your grandparents one looks very mean looking. I thought we were about due an update. There have been no further issues with the ABS so far, and the car appears to be performing well! I have mostly just been enjoying driving it recently. 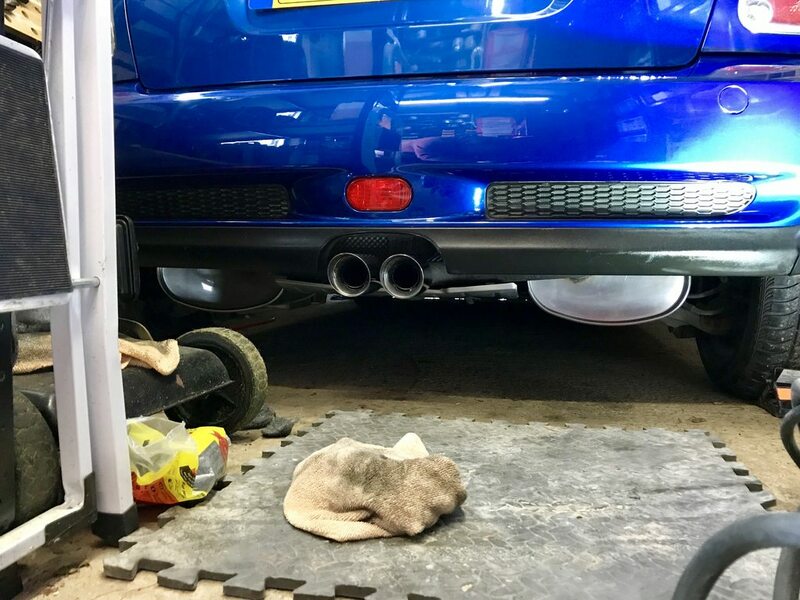 After washing the car, I noticed the exhaust tips had got a bit grubby and lacked their usual shine, so I cracked out the Autosol and brought the tips, back boxes and central undertray back to a nice shine. I tried out some Meguairs Ultimate Quik Wax which I got at christmas. It was actually still working well after 10 days which was impressive. I recently went to Center Parcs, so this was a good opportunity to give the MINI a decent run (around 60 miles) which is acutally the longest trip i've done in it! The car performed flawlessly. It's not exactly relaxed on the motorway, as it sits at around 3000rpm and feels very 'urgent' like it wants to go! But it did a great job overall, defending its honour in the outside lane with the sales reps! I also met up with some of my old colleagues on the way home and shoehorned 4 of us into the car - the back legroom really is poor. All the more reason not to be the designated driver!! 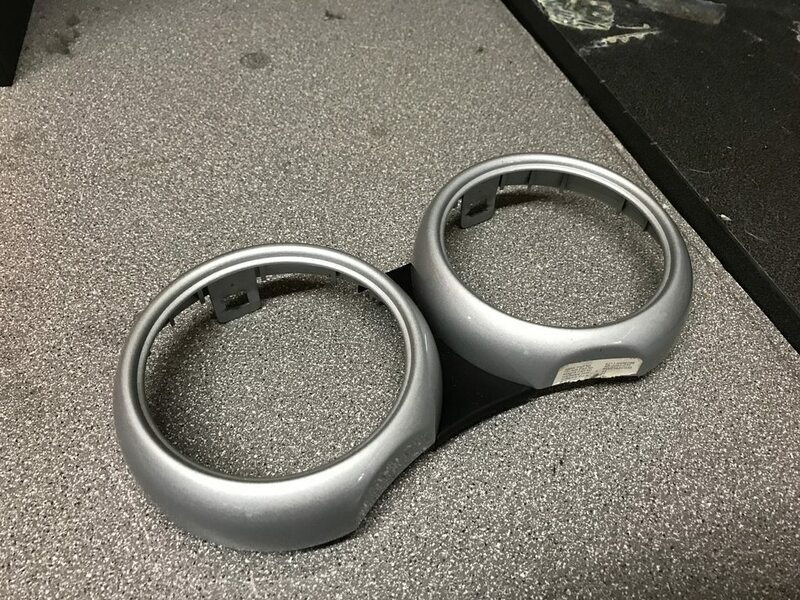 As I now had a spare speedo/rev counter surround, I decided to get it painted to match the other gloss anthracite trim rings. As I mentioned before - it seems as though MINI never made a surround in this colour for cars with the Chrono pack. Anyway, I bought some BMW Sparkling Graphite paint from Halfords. 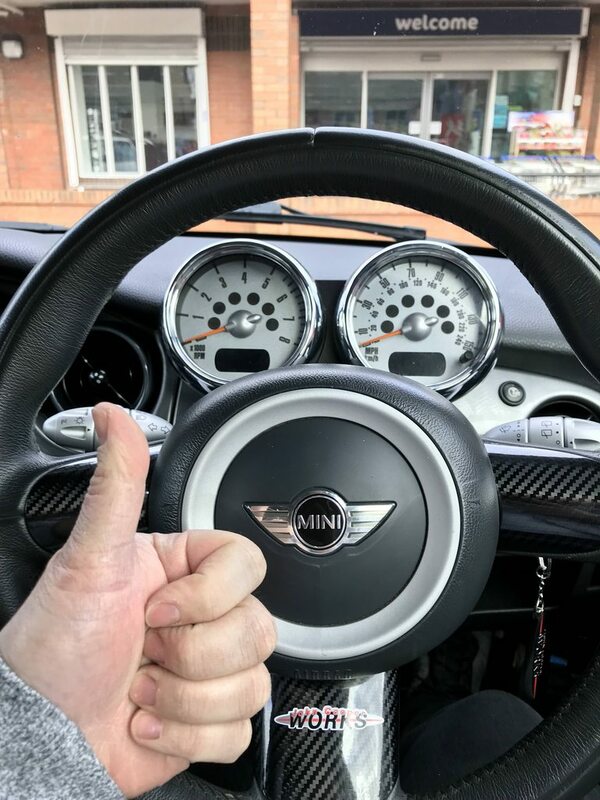 This is (I believe) identical to MINI Dark Silver which is the dark grey colour you see quite a lot of R53's in, and also happens to be the colour used for the graphite interior trim. 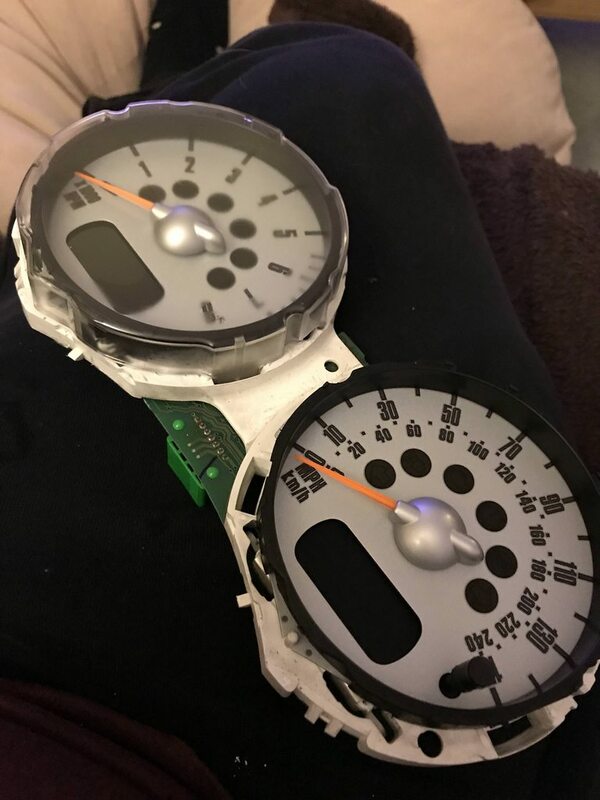 I removed the small piece of black plastic in between the two gauges and set it aside, then wet sanded the surround to remove all the silver paint (I think I got a bit carried away). I hung it from some speaker wire off the apple tree in my back garden, in an attempt to be able to spray all parts evenly, however it was too cold and too windy. So I resorted to my usual method of putting some newspaper down in the garage and accidentally painting everything in the vicinity including my own hand. I found that warming the paint and primer in a bowl of water helped them perform much better in the low temperatures. I applied 3 coats of primer, sanding with 1200 grit in between coats. 3 coats of paint, and then several coats of lacquer - however I couldn't get much gloss from it which I later found was probably due to the lacquer itself which is Halfords' own and gets very poor reviews, so I ordered a different kind from Amazon which gave much more gloss after a couple of coats. I can see there's some considerable 'orange peel' in the finish (probably due to it being about an inch deep in lacquer now!) but i'm going to leave it indoors to harden for a week or so, to see if I can lightly wet sand it with 2000 grit and polish it up to get a better finish. I will also paint the airbag ring and rear cup holder trim when I get round to it. The only thing letting the exterior down was the condition of the wheels. I did get some quotes last year to get them refurbished in black and silver. The cheapest coming in at about £250. 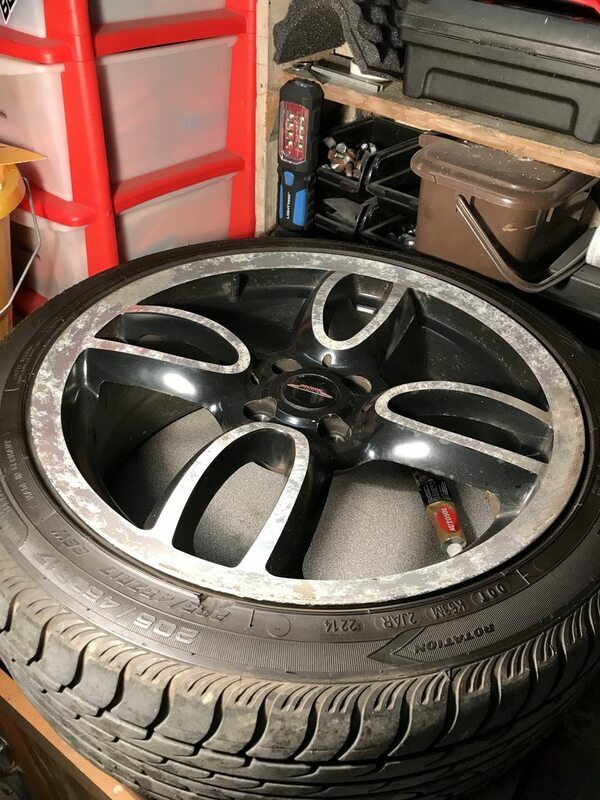 I simply don't have the money to spend on refurbishing them, so I had a look around online to see if there was anything I could do myself. 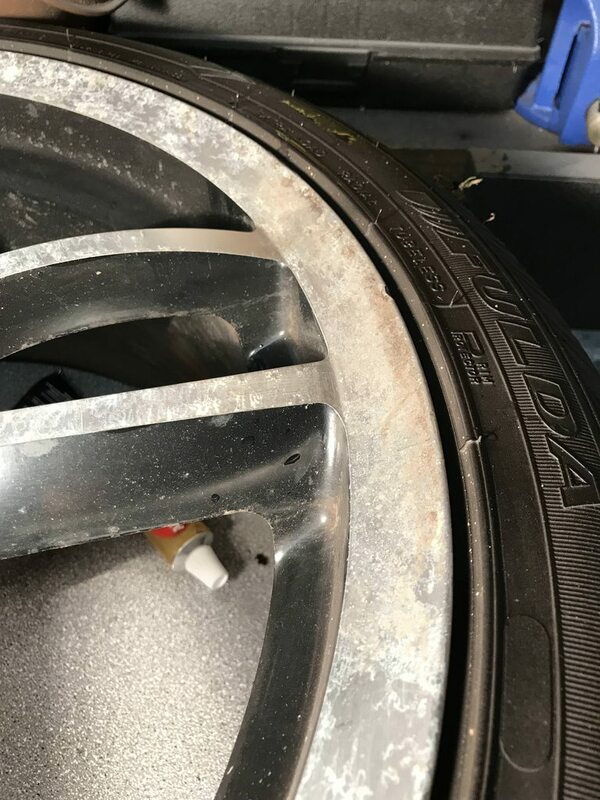 The black part of the wheels is in OK condition, but the diamond cut shiny part was totally trashed on all 4 wheels - the lacquer has completely failed leaving them looking rubbish. I couldn't find any guides on polishing or re-lacquering them when I looked last year. 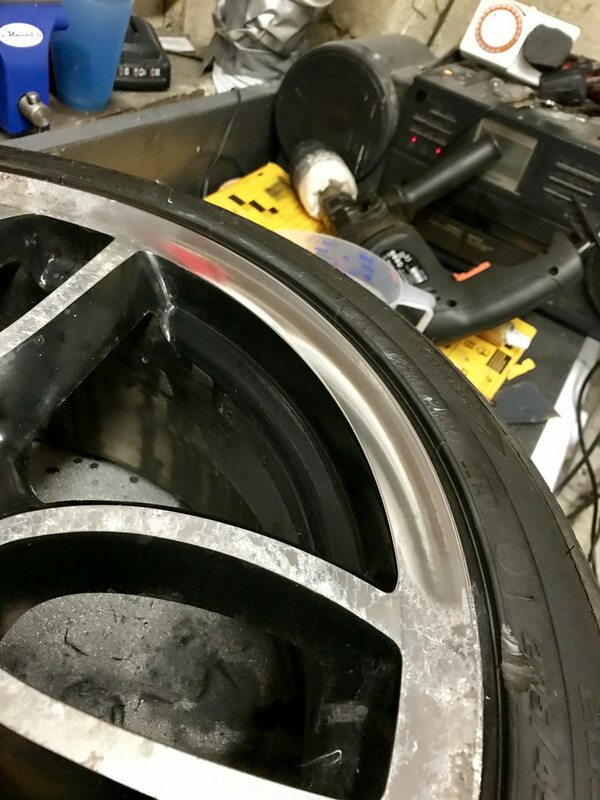 Whilst binge watching his whole project, I found a video where he tackled the weathered diamond cut wheels on the car. 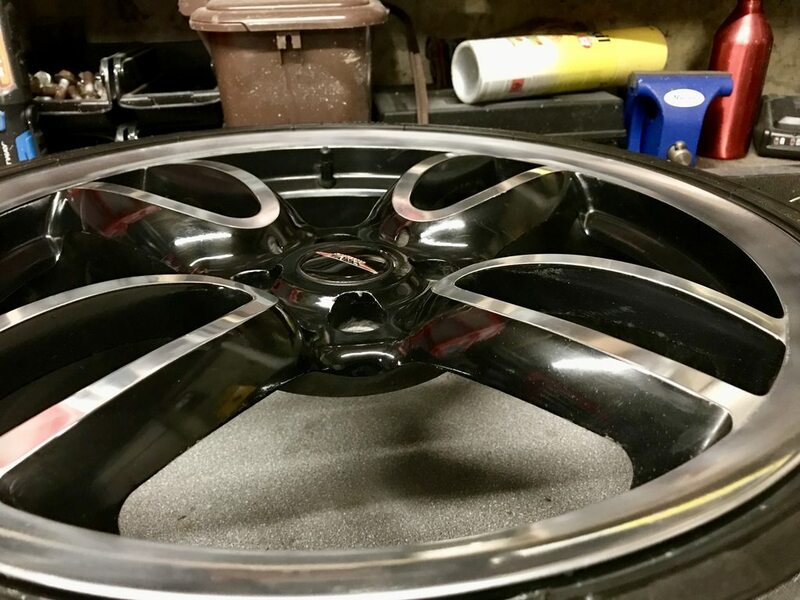 The process was really simple - sand off the failed lacquer and diamond cutting marks, then polish the surface with metal polish and protect. 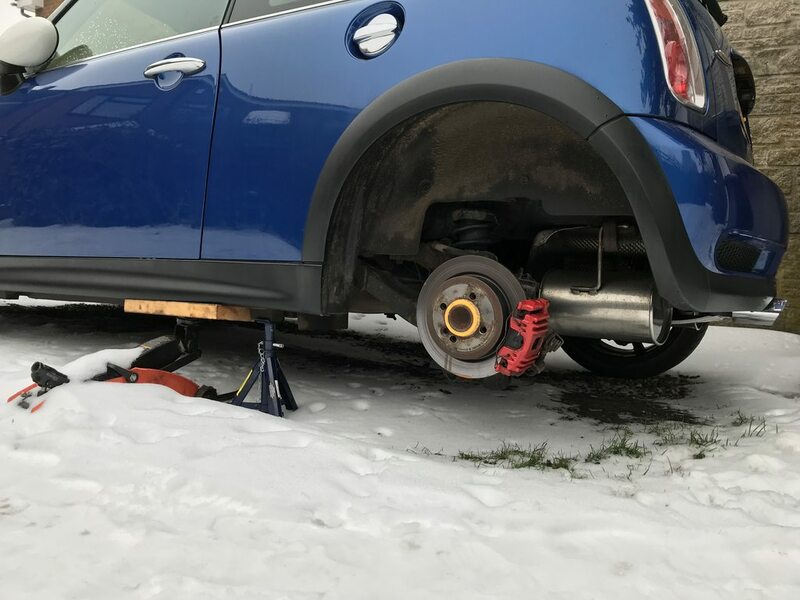 As my wheels were in such terrible shape, I figured that I had nothing to lose, and as the forecast was pretty bad - parked the car up and removed a wheel. 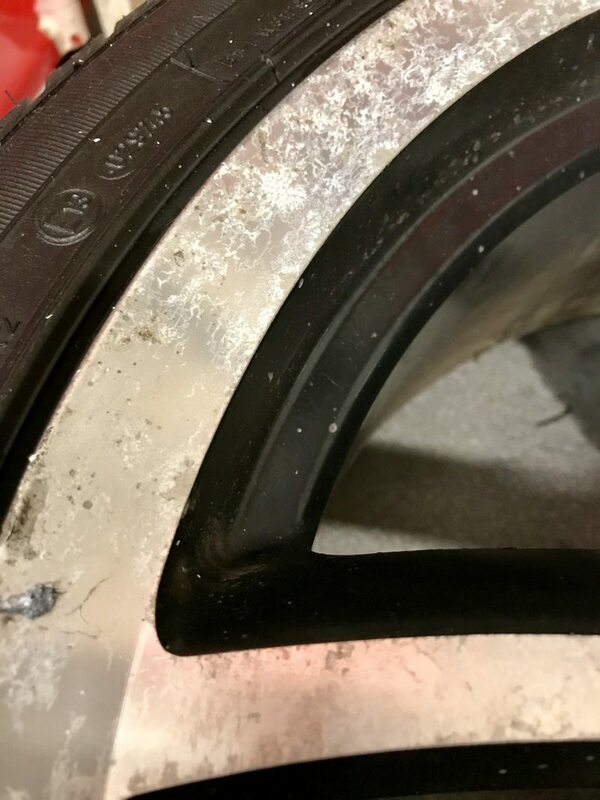 Here are some pictures of the state of the wheels - you can see how badly the lacquer has failed. 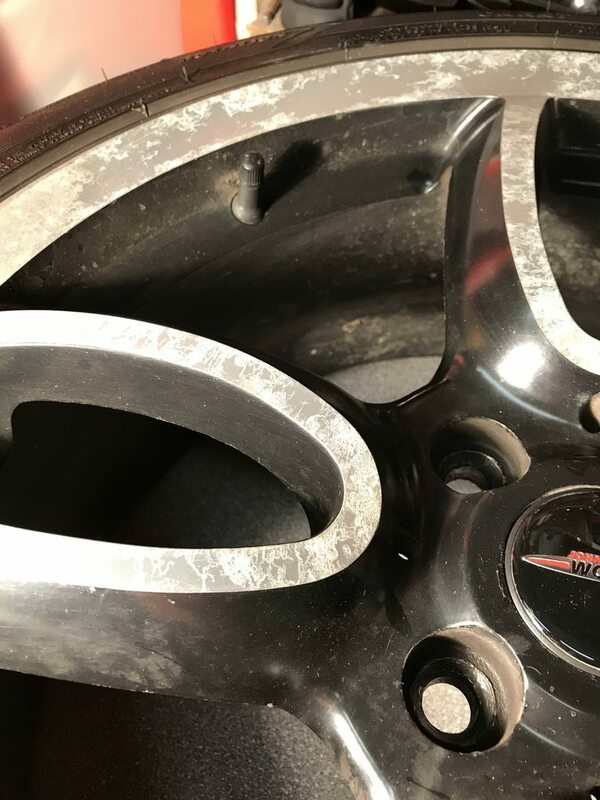 There are quite a few kerb marks on the very edge of the rims, however weirdly none of the 'kerb rash' you often see where someone has completely ground the whole face of the wheel along a kerb stone. This process refines the initial scratches down to a point that it can be polished up to give a good finish. It takes a long time to sand each wheel to a standard i'm happy with, around 2 hours per wheel. I then use the cylinder polishing wheel with some Autosol to bring it up to a shine. At this point, I inspect the surface for any marks which I haven't thoroughly sanded out, and re-sand anywhere necessary. The black painted surface of the wheels is quite dull, so I just use some left over AG SRP with the foam polishing pad on the drill. This does bring up the black surfaces really nicely, but the size of the pad and the fact it's attached to a drill means it isn't a great solution - as the drill will 'grab' if the pad gets caught in between the spokes, almost ripping the drill out of my hands. This, coupled with running at maximum RPM under heavy load for extended periods has taken its toll on my long suffering Argos drill. After the pad catching in the spokes and stalling the drill one too many times - it began to make an awful noise! I believe it is stuck on the 'hammer drill' setting and smells terrible when it runs now - but i've shown no mercy and continued to run it at full speed and will do so until it dies! I also polish the inside of the wheel with SRP, just to make it look a bit more presentable. 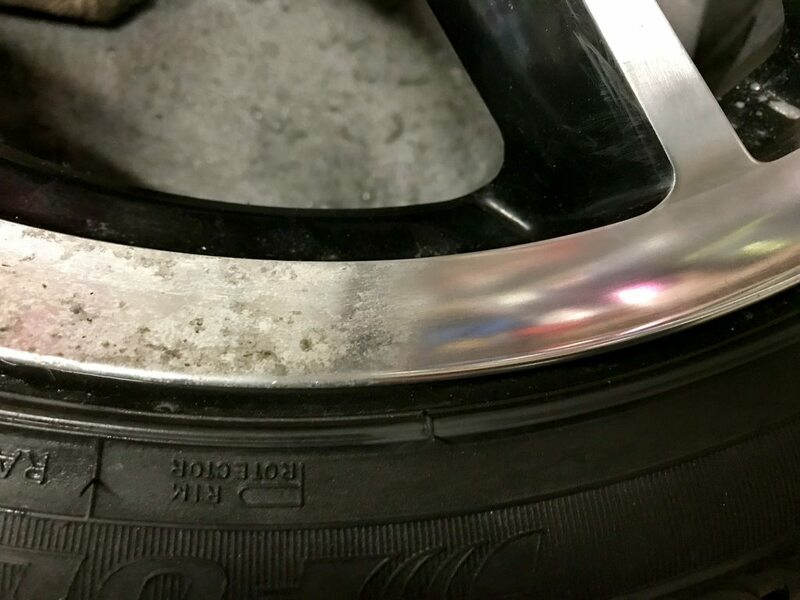 After this, I apply a couple of coats of FK1000P to the whole wheel and reinstall on the car. I decided not to try applying lacquer to the surface, as it seemed like a bit of a minefield trying to get one that would adhere to the polished metal surface properly, so I will see how it goes without any lacquer for now. I plan to just keep on top of protecting the surface and re-polishing if necessary. I have done three of the wheels so far, however the snowfall has delayed me doing the last wheel. Here are some pictures of my work so far. And polished - initial impressions are very good! One afternoon later - first wheel is complete. So pleased with the outcome - a lot of effort but very little financial outlay! Once this snow clears up, I'll be able to put wheel 3 back on the car, then remove and polish wheel 4. Luckily I have been able to press the Discovery into full service, and leave the MINI safely behind the gates until it warms up. 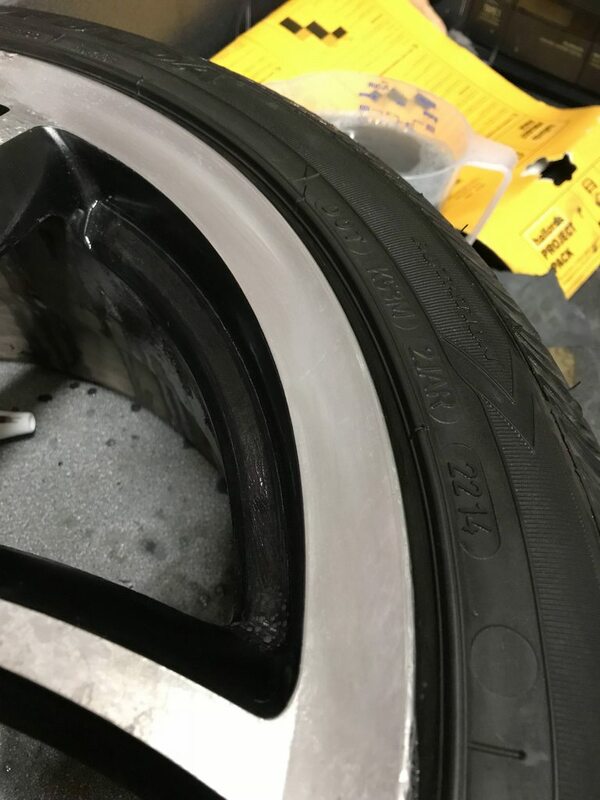 The wheels came up well bud, top work as always.